The June low for the gold mining sector was believed to the bottom for gold miners and as such presented a buying opportunity for the precious metals community. At the time we greeted this event with some trepidation and described the capitulation as a capitulation of sorts, but not a final one. In any bull market we have to climb the wall of worry and gold and silver did exactly that in the first phase of this bull market as many objectors denounced its progress. This wall of worry will always be with us as gold clings on in the hope that there is a U-turn coming and the bull returns with a vengeance. The June bottom in the mining stocks produced a rally that took this index from 210 to 280 for a gain of 33%. Since then the froth has dissipated and the HUI has dropped back to close at 204 today. It could be that the miners have returned to retest these lows and the bulls may lend a hand here by making more acquisitions, thus providing some support. On the other hand if the miners lose support and the HUI continues to plunge, then the June bottom will join the ranks of the many false dawns that we have experienced since the heady days of a couple of years ago when the HUI traded at around 625. Since then the HUI has lost almost 70% of its value, a gut wrenching disappointment for gold bugs if ever there was one. The fortunes of the gold and silver producers are largely predicated on the price of both gold and silver and so it goes that we must focus intently on their progress or lack of it, as the case may be. Although it has to be said that there are other factors that could adversely affect mining companies, such as a major stock market correction which would in turn weigh heavily on mining companies as they could be grouped with stocks in general and sold down accordingly. Since the record highs when gold hit $1900/oz, gold’s story has been a dismal one. As of today gold is trading at $1241/oz for a loss of 34%. At the end of June the rout looked to be over as gold prices traded briefly below $1200/oz and then rallied to $1420/oz in August. However, this summer rally soon faded and gold drifted forming lower lows along the way, wiping out a lot of the summer gains. Gold is now within $40/oz or so of the summer lows and could easily test those lows in the coming weeks. Again that support level needs to hold for all who are invested in this tiny sector of the market. On the positive side of this equation we have the robust demand for the physical metal especially from the Eastern part of the world. We are aware of the amount of gold that passes through Hong Kong on its way to China and those numbers are growing at a tremendous rate. China also imports gold through ports other than Hong Kong for which the numbers are vague, but could be considerable. The mints regularly report that they are temporarily out of product such is the domestic demand for coins and bars, and so we anticipate higher prices. Silver followed gold to higher levels during the summer rally when it moved from around $18/oz to around $24/oz; it has since drifted lower and today it trades at $19.63/oz. So we can see that silver is also in retest mode and could test the summer lows in the near term. The demand for silver differs from gold in that it has many industrial uses such in the manufacture of solar panels and it could therefore hold its value a tad better than gold. However, when gold moves in either direction, silver tends to follow it regardless of the additional demands for its usage. There are a myriad of positive factors that go into this mix of considerations when formulating our investment strategy: Physical demand, Debasement of currencies, Dwindling supply, Insurance against disaster, Backwardation in the paper market etc. These are all good solid arguments and are supportive of gold and silver prices in most cases. However, the fact that the precious metals are struggling to gain any sort of momentum in what is traditionally their season for making gains does not bode well for a sustained rally. The debasement argument has held good for some time and been supportive of the precious metals sector. However, the possibility of tapering still lurks in the background. A number of our readers have rebuked us for suggesting such a thing and they may well be correct. The new Fed head, Janet Yellen is said to be even more dovish than the outgoing Fed Head, Ben Bernanke. This may be so, but all along the Fed have said that they will remain data driven. Now, as our readers frequently point out, the employment numbers are riddled with low paying part time jobs and therefore this recovery is not strong enough to warrant any tapering of the current Quantitative Easing programme. We disagree on this point and are of the opinion that tapering will be introduced should the employment numbers continue to improve, but as they say; time will tell. We also need to keep an eye on the European Union and the possibility of an introduction of negative interest rates and Japan where the new government have adopted an approach of printing more money in an attempt to boost their own economy. These actions will debase the Yen and the Euro which in turn puts upward pressure on the USD which has an inverse relationship with gold and so gold prices decline. A more recent argument has been the increased activity in the options market whereby the 2015 Call Options have been purchased at a strike price of $3000/oz. We agree that someone is sufficiently confident of making a profit to purchase these contracts, but, on the other side of this trade there is someone equally as confident that they will be ones to make a profit should gold not achieve these price levels. This is more of a neutral action than one which supports gold. Many of the miners have costs in the vicinity of $1200/oz so if gold prices fall lower than their production costs they will have real problems attracting investors and could face bankruptcy. There is also some new money vying for our attention in the form of virtual money, Bitcoin. The stock market in general is still booming and is considered by many to be the place to be thus taking funds away from the precious metals sector. 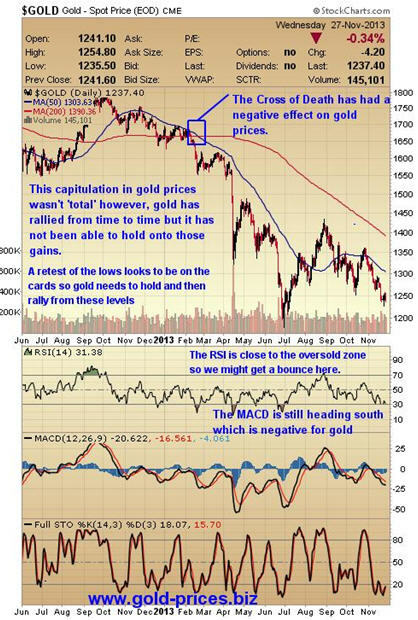 So it is down to us all to try and get the direction of the precious metals correct, in terms of the big picture, then the rest will fall into place, if we get it wrong then we could be faced with huge losses, so go gently whether you are a bull or a bear. All in all we are still of the opinion that both gold and silver will retest the June lows and penetrate them as this bear phase continues.